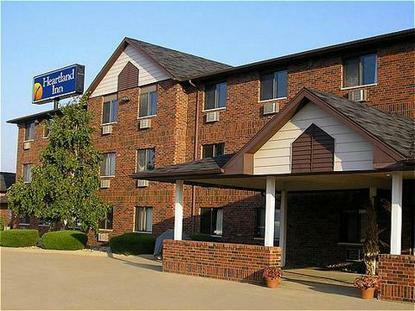 Breathe easy in the smoke-free environment of the Heartland Inn Bettendorf conveniently located off I-80 and I-74- Exit 2. Easily accessible to many attractions including Riverboat Casinos- the Mississippi River- malls- museums- Davenport- and the Moline Airport. Enjoy free evening snacks and a complimentary hearty breakfast with hot items such as biscuits with sausage gravy and fresh Belgian waffles. This property features free high-speed wireless Internet in every room- an indoor pool- sauna- game room- and a hospitality and meeting room which are perfect for reunions and small gatherings. A variety of room types range from relaxing traditional rooms to intimate whirlpool suites and are complemented by Serta pillow-top beds- cable with HBO and ESPN- in-room coffee- and hair dryers. This property offers convenience- comfort- and value to business and leisure travelers alike. Enjoy extras like free faxes- copies- and local phone calls. Hungry for value? You will love our bakers dozen. Join our Frequent Guest Program -Innside Track and every 13th night is on us. Available and redeemable at any Heartland Inn- this program is absolutely free. And best of all- there are no expiration dates- so you have the luxury of using the card at your own pace. Sign up at any Heartland Inn location and a card will be issued on the spot. Be sure to ask about the special Gold Card for use in Whirlpool or Specialty Suites. Some restrictions may apply and full details about this program are available at any Heartland Inn location. The *Innside Track* program- Because we think our guests should be rewarded with more than just great service- value and comfort. This Iowa owned and operated hotel chain is known for its Midwestern charm and Heartland Hospitality. Come home to the Heartland- you will be glad you did.